The Visual Science Lab / Kirk Tuck: The Summer Doldrums. Life slows down when it gets hot and sticky in Austin. I still go out for walks in the afternoon but I do them more slowly. When I get slower I start looking for subjects that are slower than me. I was cutting across the lawn that stretches between the manmade hill in Zilker Park and the Palmer Event Center to poke my head into the Psychic Showcase (only in Austin?) and I saw this elegant and bountiful tree right ahead of me. It's presence seemed so powerful that I stopped in my tracks and just looked at it. The horizontal expanse of branches and leaves was impressive and the leaves were so thick that the shade under the tree was an almost unbroken blanket of shadow. It was much cooler and even quieter under the canopy. I stood under the tree for a number of minutes and tried to soak in what it must be like to be a tree. To be immovable and stately. I walked back to the point at which I first became really aware of the tree and made this portrait of it. I tried to make it look as serious and stately as it seemed but I also tried to make it give me an expression of welcome. It remained neutral and a bit aloof. 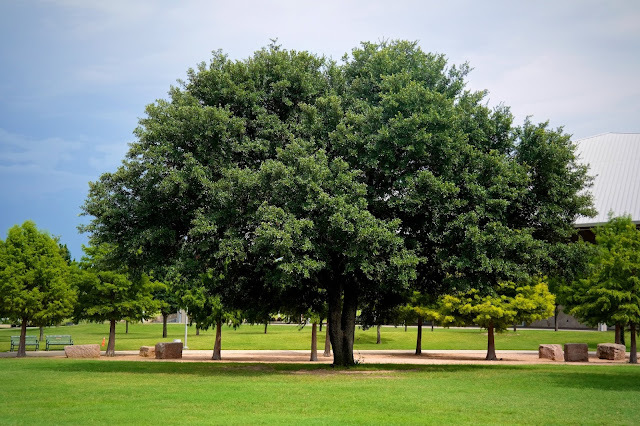 There will come a time, I am sure, when the land in central Austin will be deemed too valuable for trees and developers will cover every square inch of the inner city with concrete and buildings and black top. When that happens I'll pull out this portrait of this tree and remember a time when trees were valuable. I'll be reminded of a time when people and trees coexisted in the city. I carry my camera on my walks, in part, to record a way of life. I'm preserving my understanding of the soul of my city. That's my project. Must have one helluva root system. I wonder if it's as big below ground as it is above? I was born here in 1951, just curious if you are a native Kirk? Not a native. Arrived in 1974 to attend UT. Second best decision I've made. I can sooo relate to this! Been doing it in Sydney, Australia, for the last 7 years. Mostly around the area I work in, near the CBD. Some parks, buildings, trees, are now gone. But they remain with me in my photos. I reckon it's definitely worthwhile! ...a stately treatment of a stately tree. Here in Scotland we have a tree that was around while the Egyptians were building the pyramids. It may have been as much as two thousand years old when Pontius Pilate's father was serving in the Roman army locally. What variety of tree is it? A live oak?